We think it will be the only way to travel in the future, and it should be the case already nowadays. We need to have in mind that every action, decision and steps we make has an impact on Earth. Especially when travelling : caring for the environment but also for the local culture and habits should be instinctive. Plus, it’s easy when one is on vacation to at least take a little bit of vacation time to clean up. We believe in Nature and the environment preservation. We then adapt our ways of living trying to reduce our impact in our everyday life : we buy differently, only what we really need. We also organise clean up actions in Paris and soon around the world with My Green Trip since we are going on a World Tour in early 2019. 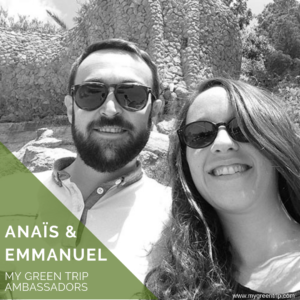 My Green Trip fits perfectly with what we had mind for our World Tour : travelling as well as cleaning up the places we visit. We believe that such actions have to be largely broadcasted thanks to the communication levels used by the association in order to reach and convince as many people as possible. We visited Sri Lanka 3 years ago : such a beautiful country with various landscapes and historical monuments to admire. But we were so sad to see how dirty and filled up with trash were some beaches, surroundings of temples and some other places. We think that the least we can do, as travelers, is to help the countries we visit to preserve the environment.